But if the “so what” is a useful tool in talking about historical arguments, it sure has a sharp edge. My problem is that I can’t help but ask the same question of myself, pretty much all the time. Why do history? Why read these books? Why bother at all to consider history as a facet of modern life? I just finished a book tonight on ethnic cleansing in Europe in the twentieth century. Turns out this author sees elements that transcend the particularism of ethnic cleansing as a phenomenon that flared in Germany and Poland in 1939-1945, in the Soviet North Caucasus and the Crimea in 1945, in Poland and Czechoslovakia in the wake of Germany’s defeat. Sounds good, author. Bravo. But I have to ask: so what? *Page, Max and Randall Mason. Giving Preservation a History: Histories of Historic Preservation in the United States. New York: Routledge, 2004. Mid-project now. The mercenary statisticians from the math department are going all Francis Bacon on the data I’ve amassed, twisting and torturing it into surrendering its secrets. There aren’t any conclusions yet, really, because the data set is incomplete. 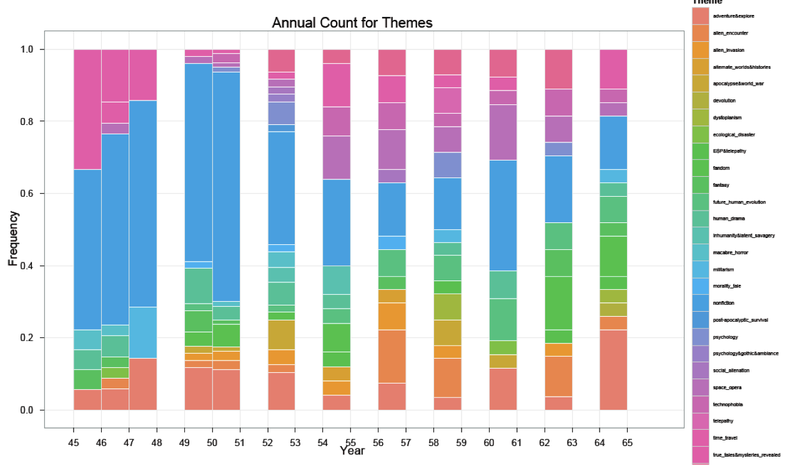 But who needs conclusions when you have mind-melting visualizations like this? Science fiction themes, atmospheric nitrogen levels, or koala synapse activity? No one knows! 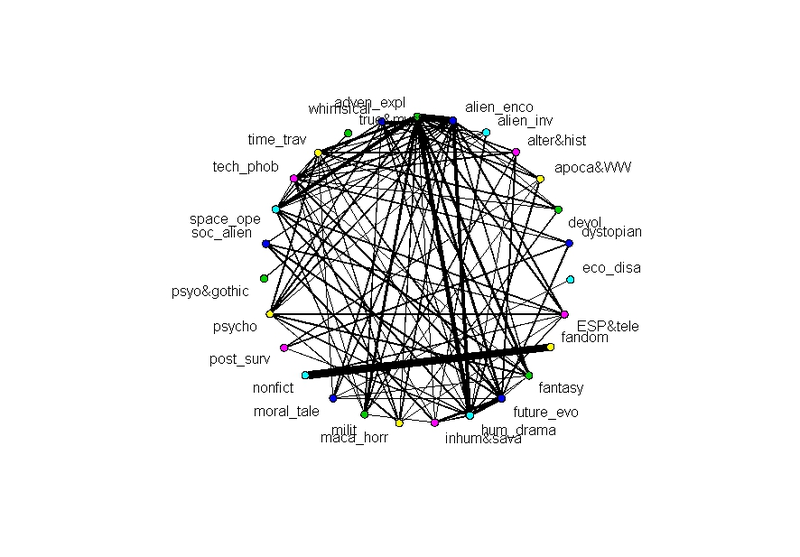 Next step: the multi-variant analysis. Comprehensive exams in 16 weeks. 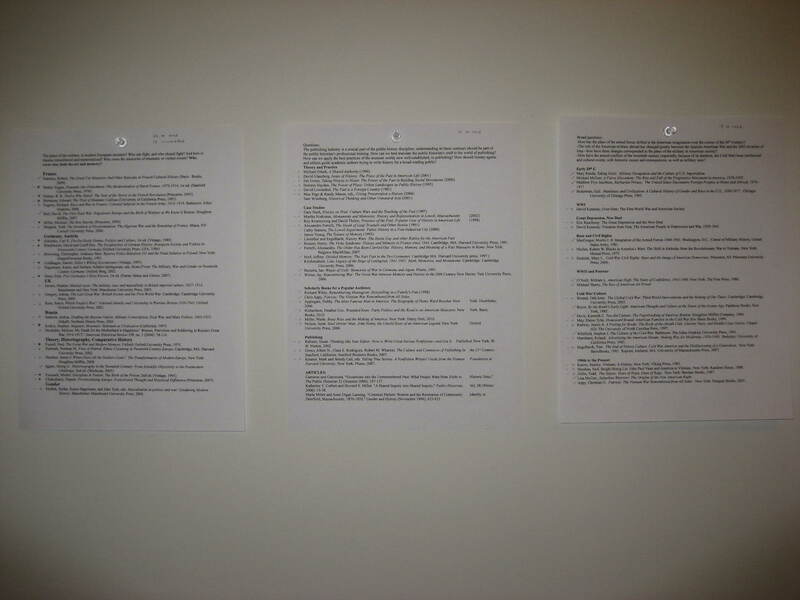 Subtract two for compiling notes and scanning previously-read books. Subtract one more for planning and draft-writing the comps themselves. That leaves 13 weeks of reading to cover 53 books. First, a self-indulgent plug: my Uncertain Futures web exhibit won the National Council on Public History’s Student Project Award for 2011! NCPH is the primary organization for public historians, our own AHA, and they only give out one student project award each year. Needless to say, I’m pumped to have won. 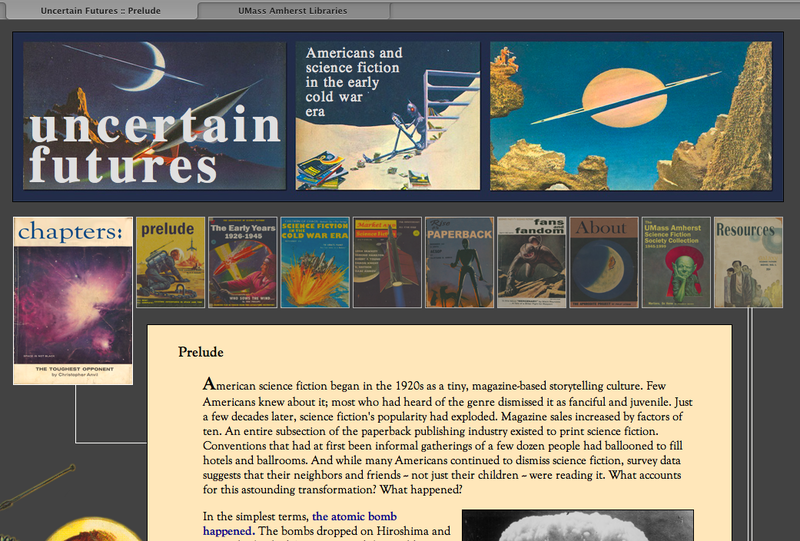 But I’m also pumped because this confirms my previously untested hypothesis that PEOPLE LOVE OLD SCIENCE FICTION. Even non-fans get into the cover art, and the general aesthetic, of Cold War-era sci-fi. This is really good news for my next project. Will keep this blog updated as the project unfolds. Right now, I have approximately a kajillion more stories to read and classify. Now, a preemptive defense of my project. I understand that reducing a story to a category or two isn’t fair to the story or the author or the genre. To this I say: too damn bad. Reducing people to their ethnicities or their tax brackets is no more fair, but we need the data to make policy. How else can we draw conclusions about large groups of things, if not by extracting relevant data and ignoring everything else? And besides, I’m a fan. I’m one of the good guys. 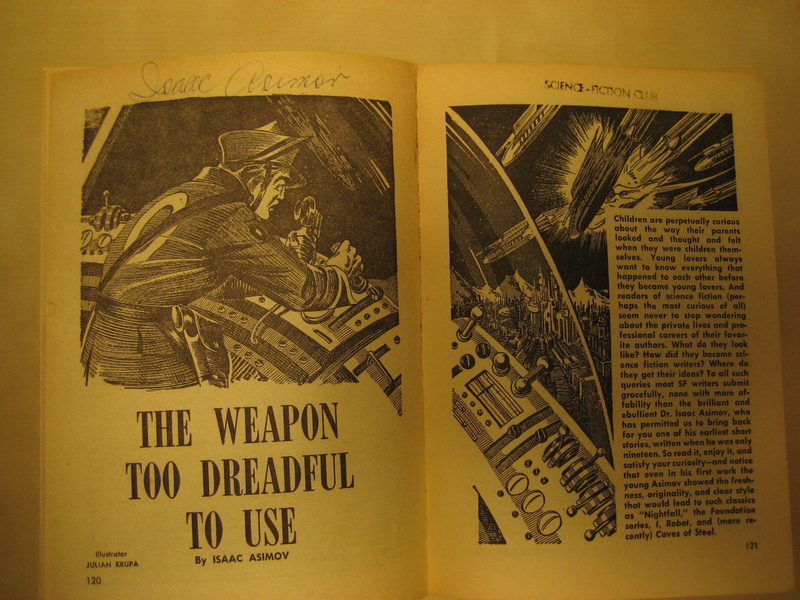 I grew up with science fiction, and I care about the genre. This project is an insider’s labor of love, not an outsider’s ruthless deconstruction. Friday night I saw Joe Haldeman speak at UMass. 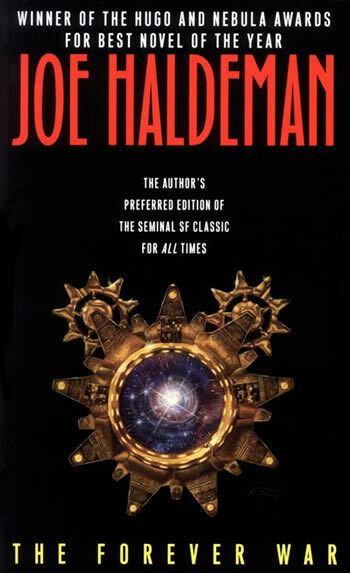 Haldeman is a seminal science fiction writer, and far and away my favorite author. His sentences are cut gems, hewn from important ideas and then reduced to glittering concision. He said he only spends about three hours a day writing. Haldeman’s most important (and most widely read) book is The Forever War. It’s been billed by some as a play-by-play rebuttal of Heinlein’s militaristic Starship Troopers, but Haldeman said on Friday night that’s not true. The book is a staggering indictment of war. The main characters are draftees, compelled to fight a war against an incomprehensible enemy on the other side of the galaxy. The relativistic effects of their almost-as-fast-as-light travel mean that when they return to earth, centuries have passed, though to them it’s only been months. Everything has changed. Everyone they knew is dead; their former home is as alien as things they’d been trying to kill. The book is really about Vietnam, and the profound sense of displacement many servicemen felt upon returning from that war. Haldeman served, but not willingly. He was drafted. He told the audience that he was a pacifist then and that he’s one now. 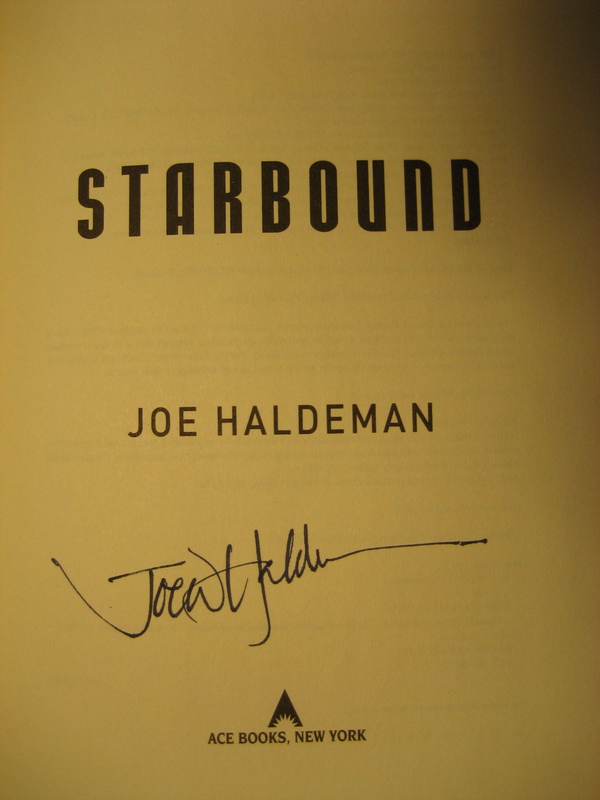 I spent a blissful fifteen minutes talking to Haldeman after he gave his remarks, and he signed my copy of Starbound, his most recent book. I don’t go all fanboy very often, but in this case I made an exception. I’ll accept the challenge and will use my five minutes (or, if you want to put it in terms of billable hours, my “o.1”) to address the subject of lawyer jokes. The professional pet peeve that I’ll share is the serial misuse of the famous line from Shakespeare’s Henry VI — “The first thing we do, let’s kill all the lawyers” as a criticism of lawyers, a sort of literary lawyer joke. Why does this bug me? One reason is that the quotation is most likely an argument for the importance of lawyers (it’s the member of an angry mob trying to bring down the state that’s being quoted here, after all). But it may not be that straightforward. The Wall Street Journal’s Law Blog has some nice analysis here.